With a chic cappuccino surface, this 2 piece nesting table set adds exceptional style to any room. The unique 8mm thick tempered glass base provides sturdy support as well as a contemporary look. Use this multi-functional set as end tables, lamp tables, decorative display tables, or simply as accent pieces in your living room, family room, den, or office space. Spacious cappuccino table tops for accessories, decorative items, etc. When it comes to adorning your living space, this 3 piece nesting table set is an attractive way to style your home. The legs and apron of these rectangular pieces are wrapped in a rich cappuccino colour, which blend beautifully with most decors, while the muted shades of cream, onyx and gray of the marble-look table tops makes this accent piece stand out. Use this set as side/end tables or as snack tables when entertaining. 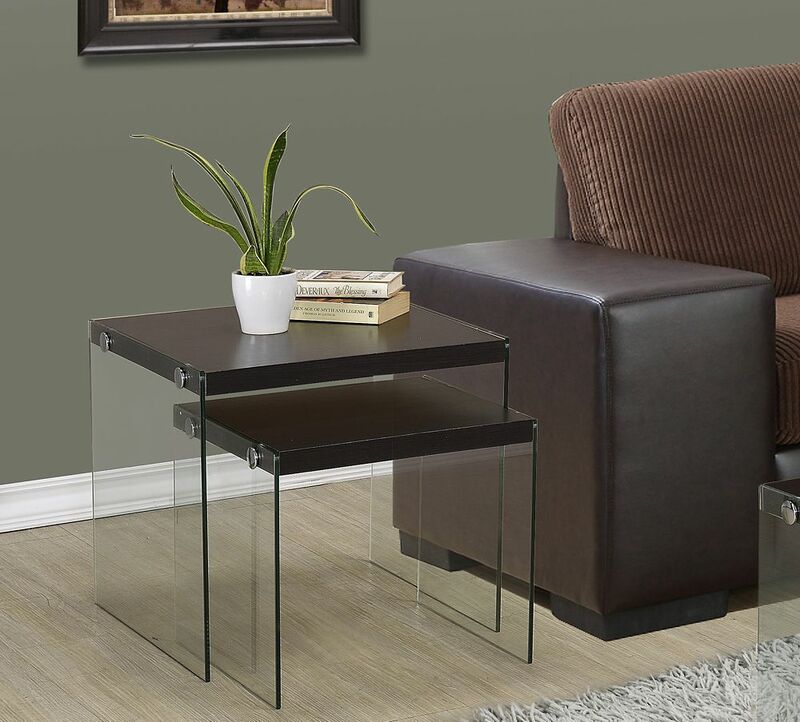 Nesting Table - 2pcs Set / Cappuccino / Tempered Glass With a chic cappuccino surface, this 2 piece nesting table set adds exceptional style to any room. The unique 8mm thick tempered glass base provides sturdy support as well as a contemporary look. Use this multi-functional set as end tables, lamp tables, decorative display tables, or simply as accent pieces in your living room, family room, den, or office space.